FORT WAYNE, Ind. (AP) — Officials say two sea lion sisters have died after 17 years at the Fort Wayne Children's Zoo. SEATTLE (AP) — Federal officials are attempting to find the people who are killing sea lions near Seattle, offering a $20,000 reward for information to find the perpetrators. ANCHORAGE, Alaska (AP) — A sea lion lunged onto a fishing boat off the Aleutian Islands last weekend, biting a crew member on the leg and trying to pull him into the water, officials said. It marked the third time since 2017 that Stellar sea lions have bitten fishermen from the community of Sand Point on their legs. BUENOS AIRES, Argentina (AP) — American conservationist Kristine Tompkins said Thursday that the creation of Argentina's first marine national parks is a milestone that gets it close to meeting its U.N. recommended goal for 2020. Argentina's Congress on Wednesday approved the "Yaganes" and "Namuncura-Banco Burdwood II" parks in the southernmost Argentine sea, covering a combined area of 39,000 square miles (101,000 square kilometers). POINT REYES STATION, Calif. (AP) — A California sea lion was recently found dead with several gunshot wounds on a beach at Point Reyes National Seashore. SEATTLE (AP) — A necropsy has determined that a seal lion died from a gunshot wound, marking the 10th to have been found shot and killed in the Puget Sound. The Seattle Post-Intelligencer reports the Seal Sitters Marine Mammal Stranding Network confirmed the death of the sea lion found in west Seattle last week. NEW ORLEANS (AP) — A pair of visually impaired 2-year-old sea lions has joined the four sea lions already at the zoo in New Orleans. Ayah and Jolee were both malnourished when they were rescued along the California coast in June 2017, according to a news release Friday from the Audubon Zoo. SEATTLE (AP) — Since September, six sea lions have died from gunshot wounds in central Puget Sound and Kitsap County. The Seattle Times reports that another seven are suspected to have died from "acute trauma" caused by humans, including a decomposed sea lion with its head sliced off found washed ashore Tuesday in a West Seattle cove. SEATTLE (AP) — Necropsies on the carcasses of two California sea lions that recently washed up on the shores of the residential area of West Seattle both showed the mammals had been shot. A team of scientists performed the necropsies Thursday. The results confirmed that four of the five sea lions that washed ashore in the area since late September were shot. SALEM, Ore. (AP) — Oregon wildlife managers on Thursday received federal approval to trap and kill California sea lions that eat protected fish. The National Marine Fisheries Service approved the Oregon Department of Fish and Wildlife's request to trap and euthanize up to 93 animals a year on the lower Willamette River. Jon Nichols, 31, of Cordova, was sentenced Tuesday to five years' probation, three months of home confinement and 400 hours of community service. SAUSALITO, Calif. (AP) — A rescue center says California sea lions are coming down with a potentially fatal bacterial infection in near-record numbers. The Marine Mammal Center in Sausalito says more than 220 sea lions rescued this year have been diagnosed with leptospirosis. It's the second-largest outbreak recorded by the rescue center. LAGUNA BEACH, Calif. (AP) — A sea lion, rescued after being found with fish hooks embedded in her mouth, has made it to San Nicolas Island — the most remote of California's Channel Islands. The Orange County Register reports Huntington Beach City Lifeguards found the sea lion, named Raptor, on the sand near the Huntington Beach Pier on June 13. LIMA, Peru (AP) — Foreign tourists are flocking to a group of rocky islands a few miles off the coast of Peru's capital for a once-in-a-lifetime experience: a chance to swim with sea lions. ANCHORAGE, Alaska (AP) — Wildlife officials came up with a new plan to try and coax a Steller sea lion back to the ocean after it had been shuffling through neighborhoods in Sitka since Friday. DES MOINES, Iowa (AP) — A popular, elderly sea lion known has died at the Blank Park Zoo in Des Moines. The Des Moines Register reports that Pupper died Thursday. She was 29. Preliminary results of a necropsy show she suffered a chronic health condition. The zoo says in a statement that Pupper received care related to her age, but did not display any symptoms of pain. VANCOUVER, Wash. (AP) — A bill that would make it easier to kill sea lions that gobble endangered salmon in the Columbia River has cleared a key committee in the U.S. Senate. The measure allows the federal government to issue permits to Washington, Idaho and Oregon, and several Pacific Northwest tribes, allowing up to 100 sea lions to be killed a year. KENAI, Alaska (AP) — Researchers are turning to crowdfunding to keep afloat the video equipment used to monitor sea lions at a rookery just south of Resurrection Bay. ASTORIA, Ore. (AP) — Kristin Covert was on the deck of her house near the east side of the Astoria Bridge watching sailboats arrive Sunday evening for a yacht race when one boat in particular caught her eye. She picked up a scope to get a closer look and saw a huge splash. Her first thought was, "Whoa, that was a really big sea lion." SALEM, Ore. (AP) — The Oregon Department of Fish & Wildlife says its latest attempt to discourage savvy sea lions from feasting on native fish at Willamette Falls has proven to be an exercise in futility. ANCHORAGE, Alaska (AP) — Federal prosecutors have charged an Alaska salmon boat captain and a crew member with killing 15 endangered Steller sea lions nearly three years ago. Thirty-one-year-old Jon Nichols of Cordova, skipper of the Iron Hide, and 21-year-old deckhand Teddy Turgeon of Wasilla also are charged with obstructing the government's investigation. Sparky the sea lion is getting new digs at St. Pauls Como Zoo, thanks to a $15 million bonding appropriation from the Minnesota Legislature. The appropriation from the 2017 bonding bill will pay for design, engineering and construction costs for the $19.8 million seal and sea lion habitat renovation. Private donations will cover the remaining costs. NEWPORT, Ore. (AP) — The 700-pound sea lion blinked in the sun, sniffed the sea air and then lazily shifted to the edge of the truck bed and plopped onto the beach below. Freed from the cage that carried him to the ocean, the massive marine mammal shuffled into the surf, looked left, looked right and then started swimming north as a collective groan went up from wildlife officials who watched from the shore. CANNON BEACH, Ore. (AP) — People gathered this weekend to watch researchers perform a necropsy on a Steller sea lion that was found dead near Haystack Rock in Cannon Beach. The Daily Astorian reports the sea lion that washed ashore Feb. 26 was moved to south to a more remote section of beach. SAN JOSE, Calif. (AP) — The population of California sea lions has tripled in the past 40 years to more than 250,000. A potpourri of thoughts from an octogenarian. A look at the unintended consequences when we pass laws to solve a problem. Example: In 1972 Congress passed the Marine Mammal Protection Act. At that time there were approximately 10,000 sea lions scattered along the Pacific coast and salmon were plentiful. Today there are over 300,000 sea lions along the Pacific coast and Fish and game departments in this area are trying desperately to keep salmon from becoming extinct. An average size sea lion eats 48 pounds of salmon each day. Solution? Just connect the dots. SAN FRANCISCO (AP) — Two unusual sea lion attacks in a San Francisco Bay cove led authorities to close the popular area to swimmers Friday as officials try to determine the reason for the aggressive behavior. A sea lion bit a man in the groin area Friday as he swam in the waters off San Francisco Maritime National Historic Park, park spokesman Lynn Cullivan said. It was "a very serious bite," and the man was taken to a hospital, he said. ISLAMORADA, Fla. (AP) — Eight sea lions have returned home to a marine attraction in the Florida Keys after being evacuated ahead of Hurricane Irma. The sea lions arrived back at Theater of the Sea following a two-month stay at a marine mammal facility near Sarasota. Theater of the Sea curator Beverly Osborne said Wednesday the sea lions were evacuated because they are primarily terrestrial marine mammals, and there was a risk they might be hit by flying debris. LITCHFIELD PARK, Ariz. (AP) — The Wildlife World Zoo, Aquarium & Safari Park west of Phoenix has welcomed Arizona's first baby sea lion. Officials say the pup was born a few weeks ago. Since it's the first marine mammal to be born in Arizona, the baby has been named Sunny. SALEM, Ore. (AP) — State officials are warning Oregonians to keep their dogs away from sea lions. A bacterial outbreak that began last month has been causing sick or dead sea lions to strand themselves on beaches in Lincoln, Tillamook and Clatsop counties. The disease can spread through contact with urine or other bodily fluids of an infected animal. Dogs are more likely to come into contact with distressed sea lions, so they face a higher risk of infection than people. 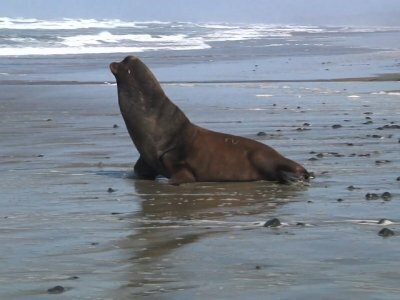 A bacteria outbreak is making sea lions sick along the Oregon Coast, so state officials are warning people and their dogs to stay away from the animals. The outbreak began in September and likely will last into December, said Jim Rice, a researcher at Oregon State University. He studies and helps sick or stuck animals along the entire Oregon Coast as stranding coordinator with the Oregon Marine Mammal Stranding Network. Calls about distressed or dead sea lions have been coming in regularly. It’s not unusual to see cute critters with whiskers at the Spokane County Interstate Fair, but it is unusual to see ones with flippers. This year there are sea lions at the fair as part of the Animal Training and Research International sea lion encounter based in Moss Landing, California. The organization is run by Jenifer Zeligs, who holds a doctorate in psychobiology and created the program. LAGUNA BEACH, Calif. (AP) — California wildlife officials say a veterinarian decided an injured sea lion spotted around Dana Point Harbor in Southern California had to be euthanized due the severity of its injuries. The Orange County Register reports (http://bit.ly/2eOcUT4 ) a team from the Pacific Marine Mammal Center found the 3-year-old, 100-pound sea lion at Baby Beach and took it to a Laguna center to be examined. DANA POINT, Calif. (AP) — Multiple agencies are searching for an injured sea lion that has been spotted in Dana Point Harbor in Southern California in the past few days. The Orange County Register reports (http://bit.ly/2xOxjfL ) staff from the Pacific Marine Mammal Center and Sheriff's Harbor Patrol deputies set out Tuesday to search for the sea lion that was first seen Aug. 31 with a severe injury to his hindquarters. LOS ANGELES (AP) — He's big and he's loud. A nearly 700-pound blind California sea lion named Buddy has taken up residence at the Los Angeles Zoo, where his vocalizations can be heard throughout the 133-acre (54-hectare) facility. The zoo said Monday the approximately 10-year-old sea lion is adapting well to his habitat at the Sea Life Cliffs exhibit since arriving in late May. SAUSALITO, Calif. (AP) — Marine experts in the San Francisco Bay Area say an alarming number of sea lions are being treated for poisoning linked to toxic algae blooms. The Marine Mammal Center in Sausalito says it has treated 68 sea lions suffering from domoic acid poisoning, compared with 70 in all of 2016. Michael Milstein, a spokesman for National Oceanic and Atmospheric Administration, says the number "is more pronounced than we've seen in the past few years." PORTLAND, Ore. (AP) — State officials warned Monday that if California sea lions continue feeding below Willamette Falls, they could push winter steelhead trout to the brink of extinction. Boston’s newest favorite son who’ll soon be making a big splash is a newborn sea lion pup named Ron. Ron, the first offspring of the New England Aquarium’s 5-year-old rescue sea lion Tipper, was born one week ago, but won’t be ready to greet his public until fall. OMAHA, Neb. (AP) — A weeks-old sea lion pup at Omaha's Henry Doorly Zoo and Aquarium has a new name. In a contest, the public recently picked the name "Raiden" for the new California sea lion, born at the zoo on June 17. In Japanese mythology, Raiden is the god of thunder and lightning. The name is apt, as the pup was born on a stormy night that wreaked havoc on much of the metro area. OMAHA, Neb. (AP) — A newborn California sea lion pup is the newest addition at Omaha's Henry Doorly Zoo and Aquarium. The Omaha World-Herald reports (http://bit.ly/2sxOMa2 ) that the pup, currently on display, was born Saturday, and a contest to name it will be launched next week. Zoo keepers will choose several possible names for the new pup. The options will be listed on the zoo's Facebook page. The vote begins Monday and ends July 3. RICHMOND, British Columbia (AP) — A college student has startling video of a sea lion snatching a girl off a dock and yanking her into the water on Canada's West Coast. It happened Saturday in Richmond, a Vancouver suburb. University student Michael Fujiwara tells CBC News that some people started feeding the animal breadcrumbs. SAN DIEGO (AP) — A baby seal lion born prematurely to a sick mother at SeaWorld San Diego has died. The park says the 10-pound pup named Little Gem died Friday, two days after she was discovered in the pen where her mother was being treated. SeaWorld says the female pup had appeared to be healthy but long-term survival "was always questionable." A necropsy will determine the cause of death. YAKIMA, Wash. (AP) — The Yakama Nation says one of its members died on a sea lion count mission after his boat capsized on the Columbia River. The Yakima-Herald Republic reports (http://bit.ly/2oakOFS ) the Columbia River Inter-Tribal Fish Commission's announcement on Wednesday said 56-year-old Greg George died after being taken to a Portland hospital for treatment of unspecific injuries. George worked as a research technician.